The mission of ESCC Learning Resources Center/Library Division, an integral part of the college’s instructional programs, is to provide resources, equipment, and services of the highest quality to meet the educational, informational, and recreational needs of students, faculty, staff, and the community. The LRC is closed on all holidays that the college is closed and between semesters. Call 334.347.2623, ext. 2271 to confirm hours. 7:45 a.m – 4:30 p.m. 7:45 a.m – 7:00 p.m. 7:45 a.m. – 4:30 p.m. 7:45 a.m. – 7:00 p.m. 7:45 a.m. – 1:00 p.m. The LRC is closed on all holidays that the college is closed and between semesters. Call 334.774.5113, ext. 3662 to confirm hours. 8:00 a.m. – 1:00 p.m. 8:00 a.m. – 12:00 p.m.
1:00 p.m. – 4:00 p.m. 8:00 a.m. – 12:00 p.m. 8:00 a.m. – 12:00 p.m. The ESCC libraries have over 65,000 non-fiction and fiction titles. Books, except those in the Reference Collection and Genealogy Collection, may be borrowed for four weeks. Search the ESCC Online Database. As a Government Documents depository since 1969, the ESCC Library main campus maintains a collection of selected government publications from all departments of the federal government. Welcome to Online Government Publications offers a list of popular government publications. AVL (The Alabama Virtual Library) includes license agreements with 11 premier database providers for 53 distinct databases, many with full text articles, including the popular EBSCOhost and various versions of InfoTrac. With an AVL card, Alabama citizens can access content from their homes, offices or other locations. Students may acquire the AVL card from any ESCC library. The libraries have current subscriptions to 106 magazines and journals. Back issues are available in various formats. Although periodicals do not circulate, copies of articles may be reproduced. The Vertical File, housed only at the main campus library, contains articles clipped from local and state newspapers. The articles selected relate to ESCC, Enterprise city, Coffee County, and some limited State of Alabama articles. Selected articles may be photocopied which requires assistance from LRC staff. ALL TESTING IS DONE BY APPOINTMENT ONLY. APPOINTMENTS MUST BE MADE 2 DAYS IN ADVANCE. The Student’s Academic Support (SAS) Lab, located on the Enterprise Campus Snuggs Hall, in Room 100, is designed to offer all students access to equipment and materials for academic reinforcement. It is the distance learning test site for the Enterprise Campus, on-line courses, and COMPASS Tests. All scheduled tests in the SAS Lab are proctored. In addition to using testing services, students can conduct research using the Internet, use educational support software, prepare course assignments, and apply on-line for Financial Aid. Students are also welcome to create and print a “STARSGuide and Transfer Agreement (STARS—Statewide Articulation Reporting System), or check college e-mail. The Lab is equipped with up-to-date computers which are available for ESCC curriculum-related work only—no recreational use allowed. No test can be given out with an hour or less till posted closing time. The S.A.S. Lab is closed on all holidays that the college is closed and between semesters. Group Bibliographic Instruction is provided to enhance the understanding of research methods and materials. Emphasis is given to the use of WEBCAT (our online catalog), various databases, and Government Documents. Individual Instruction is also available. Books and government publications are loaned for four weeks. Reserve materials are circulated according to instructor recommendations. Materials in the periodical, reference, and genealogy collections are not loaned for out-of-building use. There is no limit on the quantity of materials loaned at one time to ESCC students. A fine of ten (10) cents per day is assessed on over-due books and a fine of twenty-five (25) cents per day is assessed on over-due Reserve materials. AV Materials have an overdue fee of twenty five (25) cents per hour that the library is open and the AV item is overdue. Patrons must pay for any lost materials as specified in the LRC Policy Manual. Both fines and fees must be cleared by the end of the semester in which the violation occurs. All fines must be paid at the Cashier’s Window in the business office. Photocopiers are available at Enterprise and Ozark locations at no charge for academic related copying. The Enterprise and Ozark campus sites offer Wepa cloud based printing. This solution allows students and employees to upload any file from campus or from home to Wepa’s cloud based server for convenient printing to one of our onsite printing stations. Wepa accounts are created automatically for students after drop and add at the beginning of each semester. Pre-paid cards can be purchased from our Bookstore or funds can be conveniently added online to your account. To learn more about this service or to manage your Wepa account please visit www.wepanow.com. 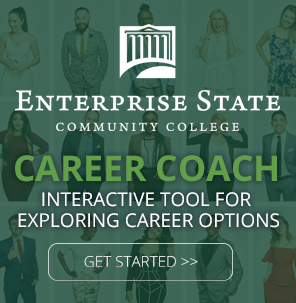 Non-Enterprise State Community College Students: Individuals who are not enrolled in a credited Enterprise State Community College (ESCC) course may use the College’s proctoring service for a fee. The proctoring service fee is $35.00 per course for one person for one semester. ESCC’s proctoring service is provided by the following individuals or their designees: the Learning Resources Center Director at the Enterprise Campus, the Dean of Instruction at the Alabama Aviation Center at Ozark and the Instructional Coordinator at the Alabama Aviation Center at Andalusia. 6. proctors will follow test administration guidelines established by the testing institution for the particular exam. Active duty military personnel are exempted from the proctor service fee. The proctor service fee is waived for ESCC employees provided they present a current employee identification card. ESCC students and staff may request loans of books or photocopies of periodical articles from other libraries. Interlibrary loan request forms may be filled out in the library. All patrons must obtain a library card to borrow books. Enterprise State Community College students may register and receive a card free of charge, which is valid for the duration of enrollment. Community patrons, 19 years of age and older, may borrow books upon registering and paying an annual $10.00 registration fee. All non-cardholders are welcome to use the resources within the building.